Whenever I plan a quick getaway with my boys, I find it really hard to decide where to go since I am a beach person but my two boys prefer swimming pools more. 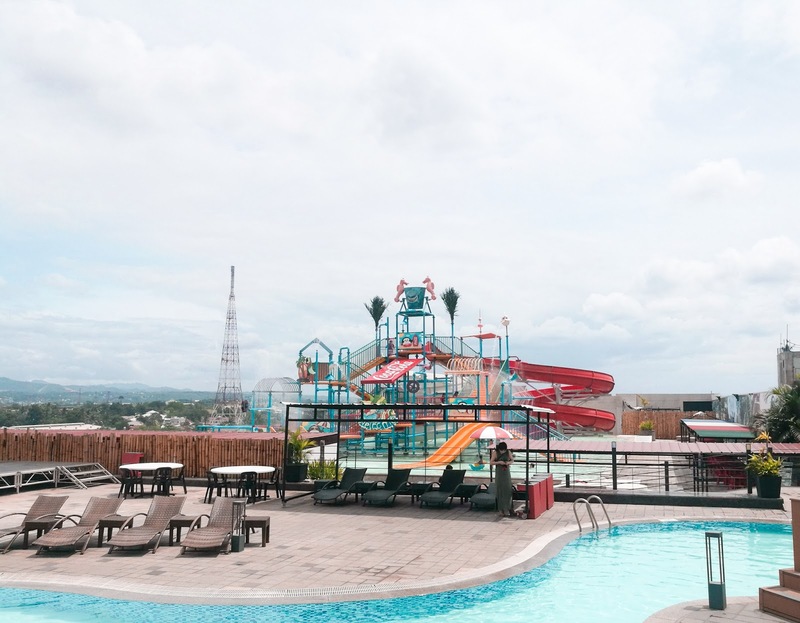 I looked for possible options on where to spend Sheen's birthday last week and decided to spend it at Sky Waterpark Cebu which is located at the 6th floor of JCenter Mall in Mandaue City. I made my boys look at the photos and they approved. Zayn was even excited with the waterpark. We spent a day at Sky Waterpark Cebu and we enjoyed every minute of it. It's definitely a perfect destination for your family and kids since there's no need to travel far because it's just within the city. Sky Waterpark Cebu is the first waterpark in the country that's built high above the ground. Because really, who would've thought a waterpark could fit in a mall, right? What amazed us even more was finding a gift shop, a spa, an entertainment area, and food concessionaires within the area. Total relaxation right at ya! The waterpark opens at 9AM and I made sure that we go there at exactly 9AM so we can take photos sans the photobombers. Haha! In fact, we arrived there few minutes before they open. We were greeted by their very friendly staff who assisted us with the registration. Regular rate for adults is Php 1000 and Php 900 for children 4-12 years old. Then the staff, who was so nice, asked us if we had an ID showing that our residential address is Cebu City so we can get a discount. Good thing I brought my cardholder and showed my UMID. Zayn and I were given 50% discounts for the day use rate. But then again, their staff were so nice, they also gave Sheen a 30% discount despite not being able to show an ID. Sky Waterpark Cebu has two swimming pools: the Main Pool and the Waterpark. The main pool is what will greet you upon entering the resort. Their main pool is really huge which features a mini swim-up pool bar, a mini island with a jacuzzi, and the best part is it extends to an infinity edge pool that will give you a panoramic view of Mandaue City and Lapu-Lapu City. Their main pool is open from 9AM - 10PM Mondays to Sundays. We were told that the waterpark will open at 10AM (but their website says it opens at 9AM) since their staff were still cleaning it. So we spent most of our time in the jacuzzi while waiting for the waterpark to open. It was already 10:30AM when we were allowed to get in the waterpark. We immediately went there since Zayn was really excited to try their water slides already. Their waterpark is perfect for kids and the kids-at-heart with its water house complete with water slides, seesaw, water curtains, climbing nets, a mini carousel, and a giant tipping bucket which is so fun especially when we hear the kids scream. Haha. The waterpark pool only has 1 feet depth so it's definitely best for playing with your kids. By the way, the entrance fee already includes a consumable amount which you can use for food and beverages (Php 100 for adults and Php 50 for children 4-12 years old). We used it to order our lunch and we just paid for the excess amount. We ordered pizza, banana split, kiddie potato smileys, and three bottles of water. Their food was actually okay and their pizza was already good for the price of ~Php 300. They have a lot of options in their restaurant menu and you can opt to buy from one of the food concessionaires as well (only you can't use the consumable amount at the concessionaires). After lunch, we let Zayn enjoy the pool (well, in his case the jacuzzi) on his own while Sheen and I relaxed on the sunbeds and simply enjoyed the moment. They also have private cabanas which you can rent since the sunbeds are available on a first-come first-served basis. It was a (birth)day well-spent at the Sky Waterpark Cebu and I highly recommend this place to everyone. It's the perfect destination for those who are looking for a getaway without traveling very far. It's the destination that you shouldn't miss. Disclaimer: This post is not sponsored in any way. All opinions epxressed about Sky Waterpark Cebu are purely my own. Baaabe! ang ganda dito. Ang colorful ng place. I will add this to my list when I visit Cebu soon! And hope to meet you din. Hihi. I'm a beach person din. I dunno I more like beach talaga kaysa sa pools. Haha! Hi babe!!! Oo maganda talaga dito! Yes, let me know when you're planning to visit Cebu so we can meet!!! I love this :D I always saw Cebu for their beaches, but then you show me this! What a great alternative! And you guys looked like you had so much fun!! Happy belated Bday to Sheen! This looks like such a fun place to treat the family to! Also, can I just say na daghan na kaayo bago na places sa Cebu? Hehe I need to go back! OMG!! Will definitely visit this place on my next Cebu visit! This looks so much fun, and I’m glad Zayn approved too. Seems perfect for both kids and adults or the kids-at-heart as you called them. I would be excited about the sliders too! This place looks like so much fun! We don't have anything quite like that around here. Smart idea getting there early! Looks like you all had a really fun time out there! I'd never been to a water park until I lived in Korea. I think they're a great day activity when your trying to beat the heat. This place looks like so much fun!! I bet you all had an absolute blast! This place looks like amazing fun! I love places like this is makes for such a great family day out that everyone can remember forever!